On the next image and in your dashboard you can see new menu item called “Slideshows”. This is where you can organize and setup your slideshow posts. 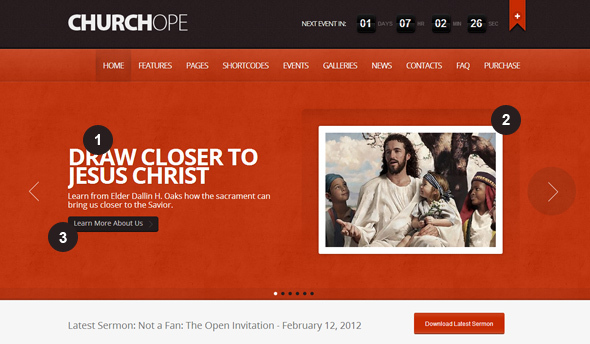 Our theme comes with extremely flexible custom full width fluid slideshow. 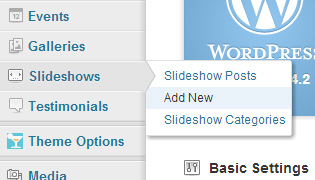 Using slideshow post settings you can create completely different slides, with background image or in frame, with different layouts for the whole slide or content area only, or even with your custom content. First of all, you need to create categories. Categories used to link your slides for specific page/post and also helps you organize your slides. I.E. : if you want to create two slideshows, you will need to create two categories and assign slides for first slideshow to first category and other slides for second category. 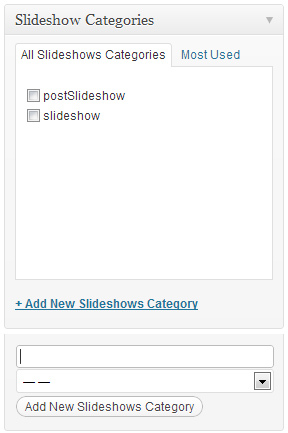 You can create category before, after or directly during the creation of the slideshow post. After that you’ll see content editor (1), where you can find shortcode buttons (2) in visual mode, and lots of metaboxes (3-5) if you scroll down, below the editor. 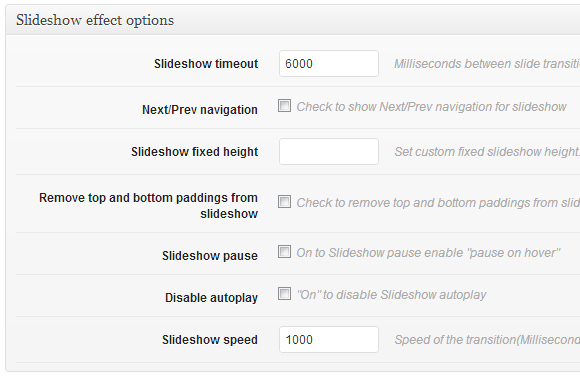 Metaboxes is where you can set differnt settings for your slideshow post, such as: slide settings (5), sidebars (3), featured image(4) etc. 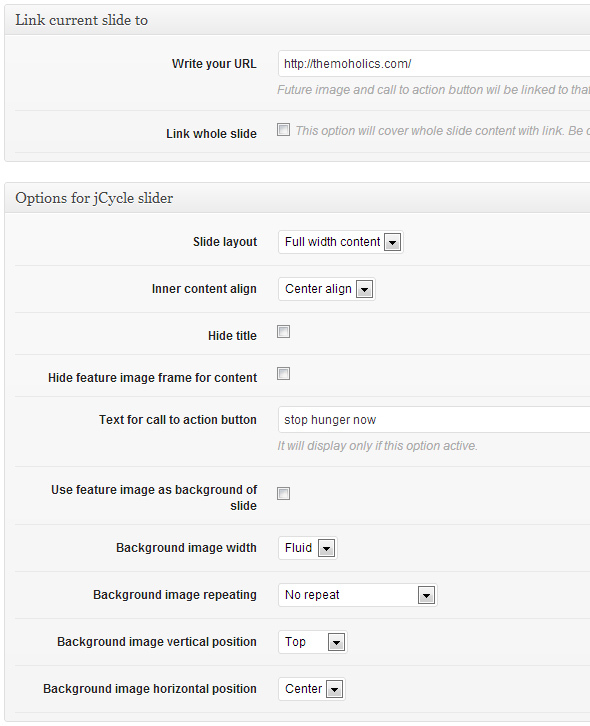 Important steps in creating slides is to “set featured image”(4) and assign category (3). On the right side you will see your categories. You need to check in which category(slideshow) you want this slide to be displayed. To do this click + Add New Slideshow Category. 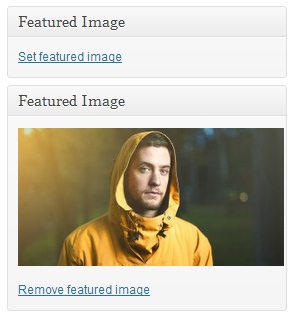 Set Category name and press “Add New Slideshow Category” button. * And don’t forget to assign this category to your slideshow post of course. You need to set featured image for your slide. This image will be displayed in your slideshow. 1. Click “Set Featured Image” on the right side of the slideshow post edit screen. 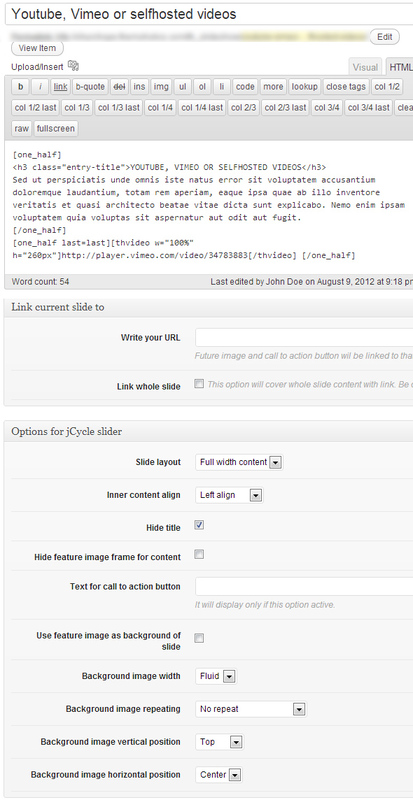 “Write your URL” option allows to to set link to your slide. By default, link will only work for slideshow image, but if you set button text it will also work for slideshow button. “Link whole slide” is what you need to check if you set image as background for example. 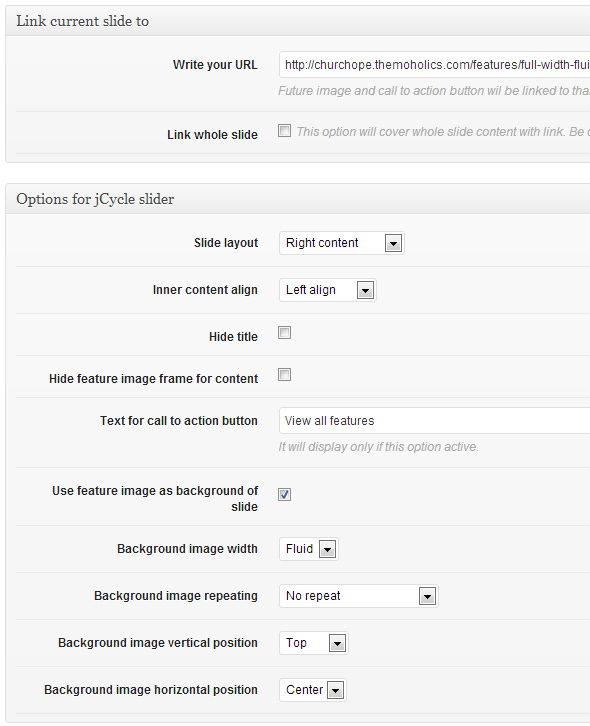 We’ve made layout options for the whole slide and content alignment for better flexibility. 1,2 Left and Right content. Slide will be divided on two halfs, where one half will contain featured image and the second half slide content and title. 3. Only Image. Only featured image with title will be displayed an will cover the whole slideshow content area (960px). Please note, if you want image to cover the whole slideshow area, then you need to set “Use feature image as background” and choose “fluid” for “Background image width”. 4. Full width content. If you set this options, then feature image won’t be displayed. You need to use this option i.e. if you want to set video in slideshow. “Inner content align” allows you to align content only inside of the slide. “Hide title” (1) – this option allows you to hide slide title. 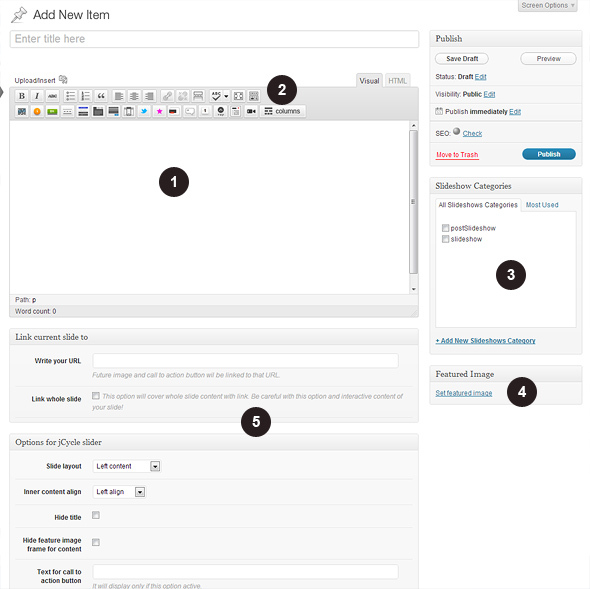 It can be used if you want to have your custom content with multiple titles, columns etc. “Hide feature image frame for content” (2) – If you add featured image it will have a frame as you can see on image below. This option allows to turn it off. 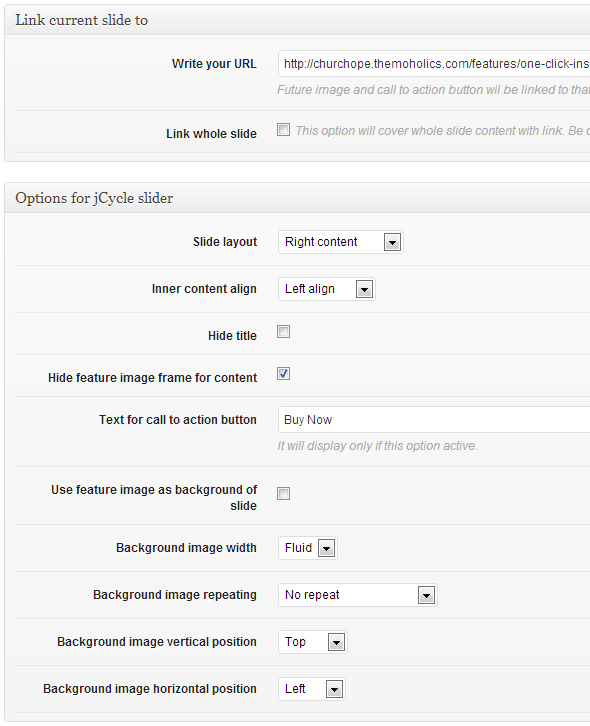 “Text for call to action button” (3) – You can add call to action button by simply adding button text. If there are no text in this filed, button will be hidden. This button will use link from “Link current slide to” section above. One of the main features of our slideshow is ability to set featured image as background. “Use feature image as background of slide” – if you set image as background, it will be under the slide content and title. Options below only work if you check this option. “Background image width” – Fluid option makes image to cover full browser withd. Fixed will cover only slideshow content area (960px). “Background image repeating” – this option allows you to make i.e. a pattern background for slideshow. “Background image vertical position”, “Background image horizontal position” – vertical and horizontal alignment for the background image. Below you can find examples of a different slide settings. To add video in slideshow you need to use slideshow shortcode, that can be found at the slide content editor panel in visual mode. You can also set slideshow as global. And your slideshow will be displayed on every page/post. To do this go to Theme Options -> Slideshows, enable slideshow and choose category. Please note, that slideshow options that you set in Theme Options -> Slideshows DOES NOT affect your slideshow options if you set slideshow specifically for your page/post. If you set slideshow for your page/post, then you need to edit settings for slideshow on that page, NOT in Theme Options -> Slideshows! Slideshow custom post types is used only for our custom JCycle slideshow. Revolution slideshow setting and slides are located at Dashboard-> Revolution Slider.